While large cities like Tokyo and Osaka certainly have their own appeal, the Japanese countryside is really something special all on its own. Forests, lakes, waterfalls and beaches… Japan has it all, and almost every inch of its rural land is breathtakingly beautiful. There is one aspect of the lovely Japanese countryside that is partially man-made, however: satoyama (里山). The word literally means "mountain village," but it’s much more than that. Satoyama refers to farmlands that are built on the base of a mountain or on the edge of mountain forests. Satoyama include crop fields as well as forests of trees cultivated for lumber and firewood. But the first thing that comes to mind when we think of satoyama is rice paddies. Green land divided into perfect sections with mountains rising in the background— it's one of the most quintessential scenes of the Japanese countryside. . . Men at work 🌱 . #明日香 #奈良 . The neat lines of the rice paddies combined with the wild nature of the forested mountains behind them is a feature unique to satoyama. Of course, terraced rice paddies are also included. Mount Fuji is an excellent area to find satoyama, because the majesty of the mountain makes them very picturesque. 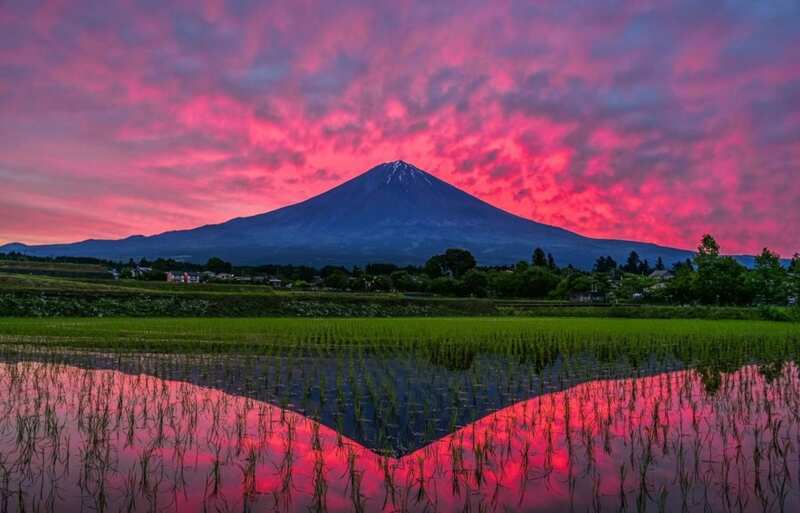 Mount Fuji is already gorgeous, but when it’s reflected in the water of a rice paddy, its beauty is doubled. No wonder they're popular spots for photographers. The vegetable fields carved into mountainsides—not just rice paddies, and not just at the base of mountains—are another kind of satoyama. These are amazing not only for their beauty, but also for the mere fact that they were created and are maintained on the side of a mountain. One key aspect to the beauty of satoyama is the verdure of the crops. Japanese farms typically grow green plants like cabbage, potatoes, eggplants and—of course—rice, as opposed to browner crops like wheat (though there are also wheat farms in Japan). This makes the farmland look like an extension of the mountain, and that could be why the Japanese countryside seems so lush for most of the year. The old-style farm buildings that dot the farmlands could also be considered part of the visual charm of satoyama. Though the term itself refers mostly to landscaping, viewers can still appreciate the addition of these quaint, man-made features amidst the green of the fields. But the thing that makes satoyama really special to Japanese people is that they don’t just sit on the border of the mountains—they work together with them in the name of biodiversity. Rice paddies are home to many insects and amphibians, who serve as sustenance for birds, and the cultivated mountain-base forests are host to a variety of plant and animal life. They’re an important ecological asset to the country, and that's what differentiates satoyama as a unique kind of farmland. Given the cultural and ecological importance of satoyama —and Japan’s reverence for nature in general—it’s no surprise that they have also been deliberately drawn into the scenery of many anime. My Neighbor Totoro, for example, is set in a colorful, detailed rendering of a satoyama northwest of Tokyo, and left a lasting impression in many viewers’ hearts and minds. Sadly, many satoyama are falling into disrepair (in part because of the modernization of Japan), but beautiful satoyama still exist all across the country. Merely traveling an hour outside of Tokyo in just about any direction will bring you to picturesque satoyama views. So on your next trip to Japan, take some time to enjoy the sights of these beautiful mountain farmlands. Read the original story from SoraNews24 via the link below.